Planting is now well under way in our small tunnel, all the days when it was pouring with rain were spent filling plug trays and planting seeds and now the fruits of our labours are being seen! The Summer Purple Sprouting, which is always very popular, was actually transplanted out into the field yesterday, covered with fleece for protection, and hopefully will soon be growing away. Next week we hope to transplant both cabbages and cauliflowers, which will make room for more seed planting. We have moved both the tomatoes and courgettes from the seed trays into larger pots, they have really benefitted from this and it won’t be long before the courgettes can be transplanted outside. We had an excellent germination of our first sewing of french beans which have now been transplanted into the large tunnel. The second sewing are doing well and hopefully these will be transplanted next week. Early sweet corn was planted into seed trays this week, once this germinates we will plant more so that we have a good succession when it comes to harvesting. 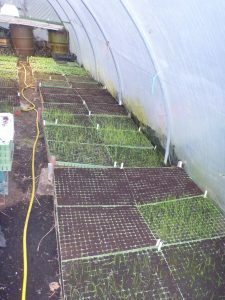 On the salad front, the first of the lettuce are in the tunnel and doing well, with the second sewing now transplanted outside. 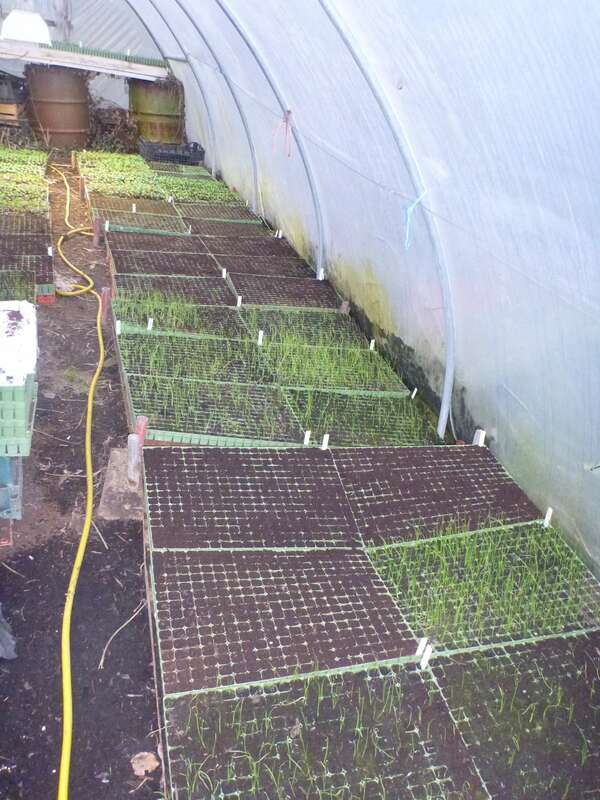 The tomatoes germinated well and and are looking strong, once the present crop of salad leaves finishes in the large tunnel we will re-plant the area with tomatoes. Cucumbers were sewn at the beginning of this week, they aren’t showing yet but hopefully it won’t be long. Outside the broad beans which were planted prior to Christmas are well in flower and subsequent plantings are doing well. We also have a good showing of peas. both conventional and sugar snap, and several lines of carrots, spinach, chard and beetroot are just starting to show. We just need lots of warm, sunny weather to help everything along.